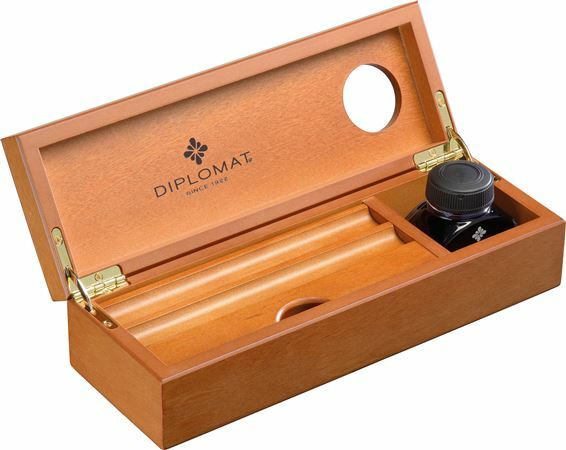 Order your Diplomat Wood Desk Equipment Box with Ink today from FahrneysPens.com. Fine Pens, Refills & Luxurious Gifts – great prices & fast shipping. The appealing desk equipment box from Diplomat is carefully crafted in dark wenge or warm cherrywood. 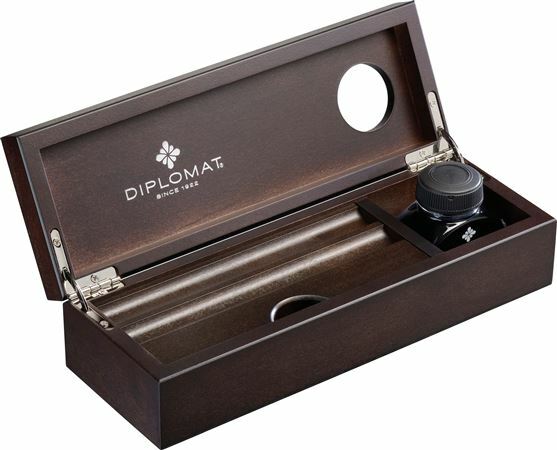 The handsome box houses a 30ml bottle of Diplomat blue ink and has a removable writing instrument tray with slots for up to two pens. Underneath the tray you’ll find a compartment for spare converters, cartridges, paperclips, stamps, etc. Measures 2.5”h. x 10”l. x 3.5”d. Fahrney’s can attach a metal plate and engrave it for a thoughtful, personalized gift option.